For some, only fishballs and fishcake made from scratch will do. For others, the chilli and requisite pieces of lard are of the utmost importance. 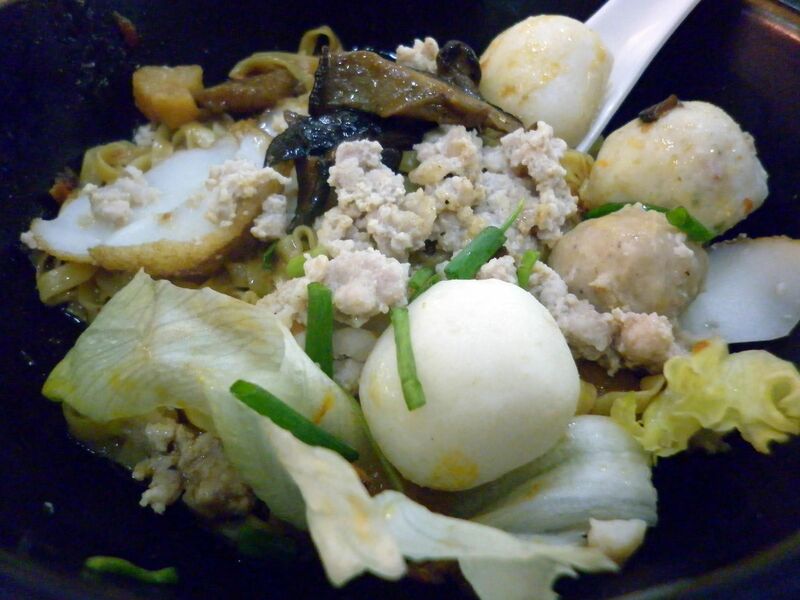 Fishball noodles in Singapore are served dry or in soup, and with a variety of noodles from mee pok to kway teow. 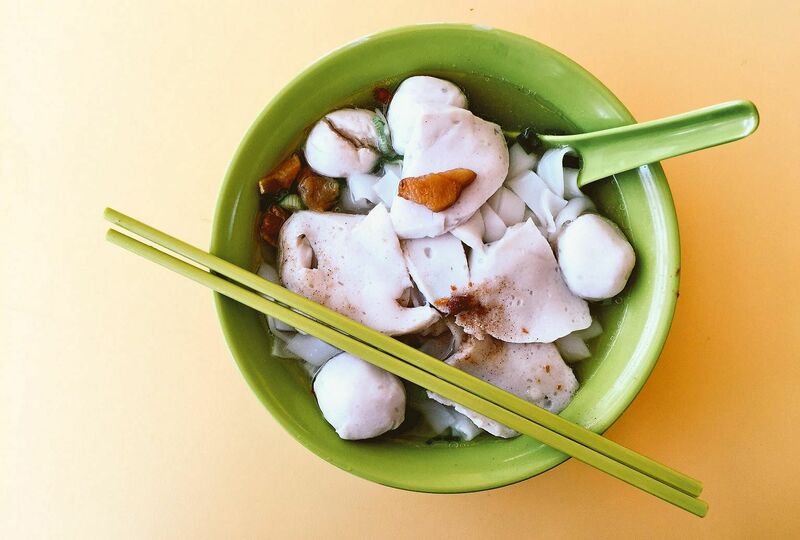 Here are The Straits Times' food critic's 10 best stalls for fishball noodles. 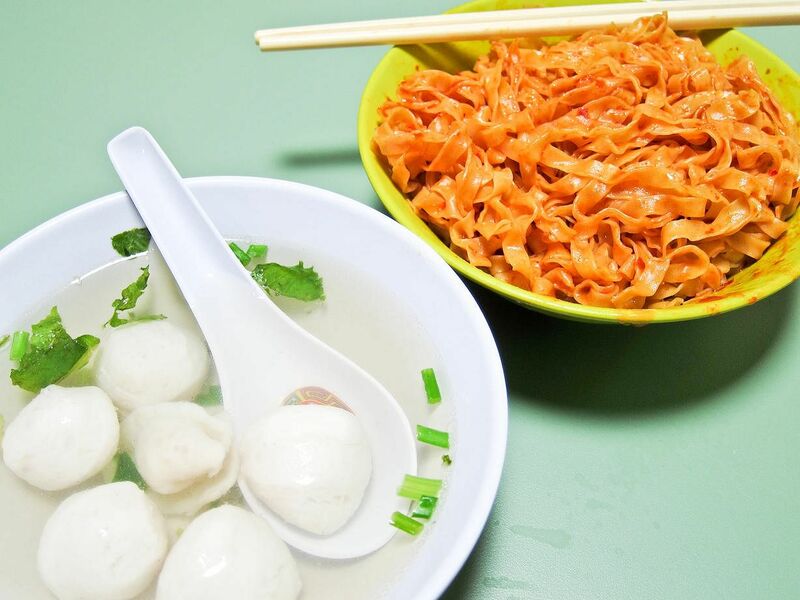 When I told a friend of mine over lunch one week that I was planning to write about the fishball noodles from Eng Huat Fishball Mee at Havelock Road Cooked Food Centre, he tried hard to persuade me not to. For me, the fishcake and fishballs are the highlight here. The fishcake here is top-notch. OPEN: 6.30 to 9am, 11am to about 1pm, or when sold out, weekday only (closed on weekend). The stall is also open in the evening, but run by another family member. All the chest-beating and hair-tearing over the erosion of hawker culture here may seem over the top, except that it is not. The food people of a certain age enjoyed decades ago have either disappeared or been diluted. Fortunately, some young people have taken up the challenge to uphold tradition. One of them is Douglas Ng, 25, who opened a stall two years ago to sell fishball noodles made using his grandmother's recipe. The fishballs, and the chilli-scallion-studded slices of fish cake, do not have the white factory sheen of most fishballs. They are a little grey and rough hewn, and are delightfully bouncy. What's even better is that they taste of fish, not flour. The generic noodles that the stall uses are a bit of a letdown, but the seasonings are robust, the cubes of crispy lard a joy to eat. Prices start at $4.50 a bowl, and I usually ask for an extra serving of fishballs and fish cake. From scratch food is rare in hawker centres, I'd better have my fill. OPEN: 8am to 6pm (Monday to Saturday), closed on Sunday. 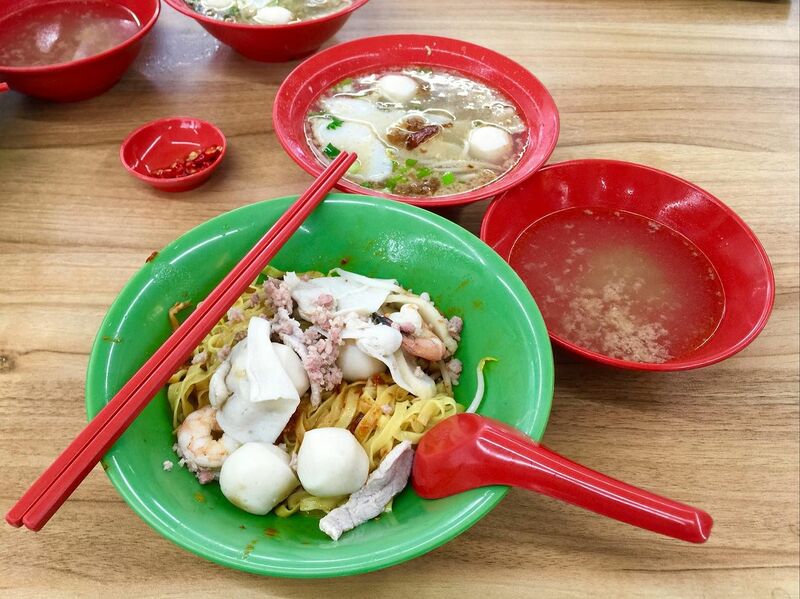 At Kovan Market and Food Centre, there are five stalls that sell a variety of fishball noodles and bak chor mee (minced pork noodles), but it is Yam Mee's traditional Teochew fishball noodles that wins me over. For $3, you get a bowl of mee pok with two fishballs, one meatball and one vegetable ball, topped with minced meat and sliced stewed mushrooms. The fishballs have a nice bite to them and do not have a fishy taste. Also, I will gladly substitute the meatball, which is quite tasteless, for another vegetable ball, which is studded with chilli and chive bits. The noodles are tossed in lard, but the chilli could be a tad more spicy. Yam Mee's other noodle dishes - laksa and curry chicken noodles - also cost $3 each and are generously portioned. The laksa comes with fishcake slices, beansprouts, fresh cockles and tau pok (fried beancurd puff), while the curry chicken noodles had thick cuts of tender chicken. If you are doing a takeaway, don't worry. The noodles lasted a good 30 minutes back to my home in Jurong without becoming soggy. For the curry chicken noodles, the yellow noodles are packed separately from the curry. To complete the yummy meal, order their stewed herbal chicken feet ($3) to go with the noodles. You get six well-seasoned big claws with lots of skin and tendon. Be prepared to queue if you are there during busy lunch or dinner periods. But the food is worth the wait and lives up to its name. Every time I see the long, snaking line for Tai Wah minced pork noodles at Crawford Lane, I feel a mad urge to yell out: "Hey, follow me!" I would take whoever is crazy enough to follow a stranger to nearby Block 462, where the queue at Teochew Fishball Noodle is not so long. Here, you can get a delicious bowl of noodles from $3 and upwards. The elderly couple have been at it for more than 50 years. For about 40 of those years, they were at Selegie Road; then they moved to the Jalan Besar area, where they plied their trade for another 14 years before moving to their current location four years ago. I usually go for mee kia or skinny noodles but, on one visit, it has run out so I reluctantly order mee pok. It turns out to be better than the mee kia. The noodles are springy and just a little undercooked. This means that the last mouthfuls are not mushy. Everything hinges on balance - the heat of chillies with the tartness of black vinegar - and it is perfect here. A spoonful of crispy lard bits and another of fried garlic complete the dish, one I wish I can have every morning. The secret to a good bowl of dry mee pok lies in the perfect combination of each component of the dish - from the chilli and the fishballs and fishcake, to the amount of lard and the texture of the noodles. Of course, different stalls excel in different areas. So when it's chilli I crave, I head to 132 Mee Pok Kway Teow in Marine Terrace, where, in its version of the popular noodle dish, the chilli sings. The tingly chilli, when tossed with springy mee pok, adds zing to the humble dish. Each bowl comes with slices of lean pork, minced pork, prawns and fishballs. Be warned that the chilli here is on the spicier end of the spectrum and is not for the novice chilli eater. 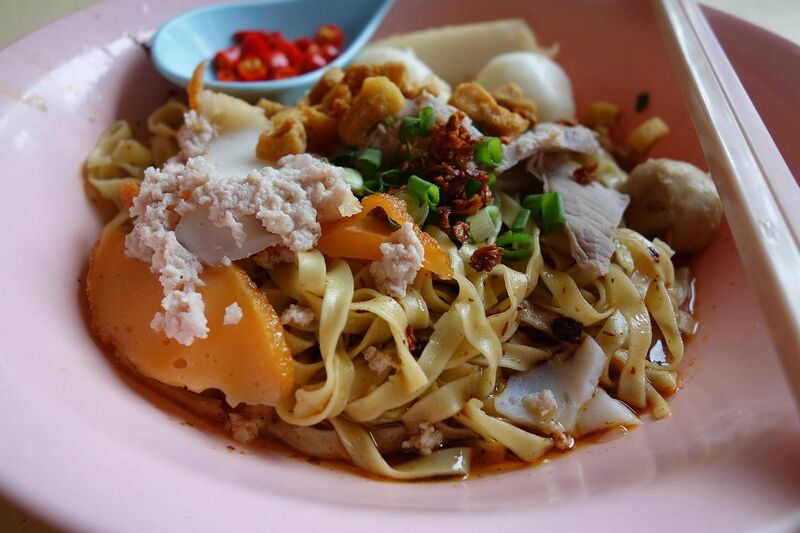 Chilli heads will not like this mee pok because there is no spicy kick. However, it is a well-rounded bowl. The palate is not assaulted by heat, so it can appreciate the tang of vinegar and the umami from the stewed mushrooms. Ming Fa's mee pok is narrower and thinner than the other two stalls at Simpang Bedok, and the noodles are not stodgy. Little touches distinguish it from the other bowls. The pork slices are not just blanched in hot water. These ones taste like they have been marinated with sesame oil and are juicy and tender. The scent of aromatic dried sole fish permeates the pork ball. Although the liver is sliced almost paper thin, it is not in rigor mortis after a dunking in boiling water. Instead, the slices are tender. Quite a feat, really. The noodles come with a scattering of crisp pork lard, which adds to the allure, at least for me. My only complaint is the painfully salty soup. If there's one thing that hits the spot for me the morning after a long-haul flight, it is kway teow tng or flat rice noodles in soup. I feel that the clean soup dish helps to neutralise all the cream, cheese and other rich foods I may have indulged in while on holiday. Sometimes, I also opt for dry noodles with a bowl of soup on the side. On the second floor of the Market Street Food Centre in Raffles Place, colloquially known to office workers as Golden Shoe hawker centre after the building's carpark of the same name, is a stall called Market Street Teochew Kway Teow Mee. It doesn't have a fancy name or a fancy signboard. In fact, it doesn't stand out from the myriad other stalls there. But the stall, which opens at 6am on weekdays, has a steady stream of regulars who stop by for breakfast every morning. It serves a comforting version of Teochew-style fishball noodles. 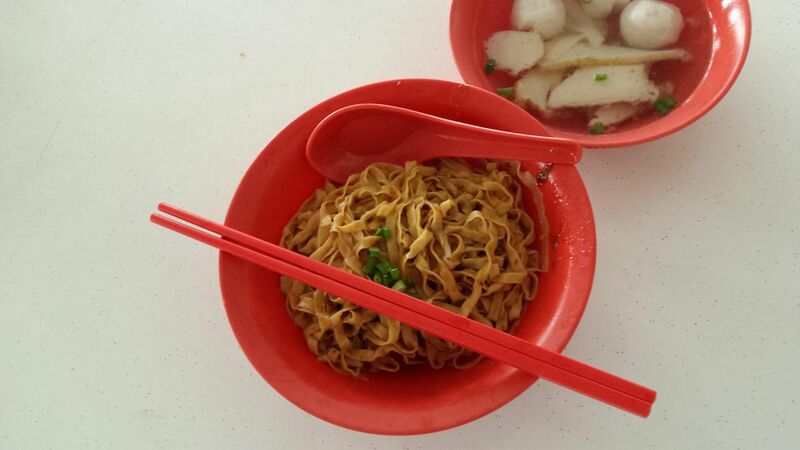 The morning I eat there, I order dry mee tai mak, or silver needle noodles, with chilli ($3). Other types of noodles available include kway teow, mee kia (thin egg noodles), mee pok (flat egg noodles) and bee hoon (rice vermicelli). The noodles are tossed in a heady combination of mildly spicy chilli with sliced garlic, lard and vinegar. It has that signature graceful Teochew flair, but also enough heft in its flavour to keep you wanting to drink the entire bowl. The irregularly shaped handmade fishballs are a little saltier than most but they are smooth, bouncy and just firm enough. The stall offers various types of noodles and soup and dry options are available (from $3 a serving). But those who like their noodles dry should note that the springy noodles here are slightly sweeter than usual, due to the combination of chilli sambal and tomato ketchup it is tossed in. From the same source, a few different streams may flow. And from the same family recipe, a few distinctive versions of a dish may follow. In the case of the Thye Hong fishball noodle family, different family members running different stalls across Singapore still get yellowtail fish from the same supplier. "We learnt the same method, we use the same fish, but what we cook tastes different," says former hawker Ng Hock Chye, 61. He is the youngest of five brothers, three of whom have noodle stalls. The eldest brother is no longer selling noodles. 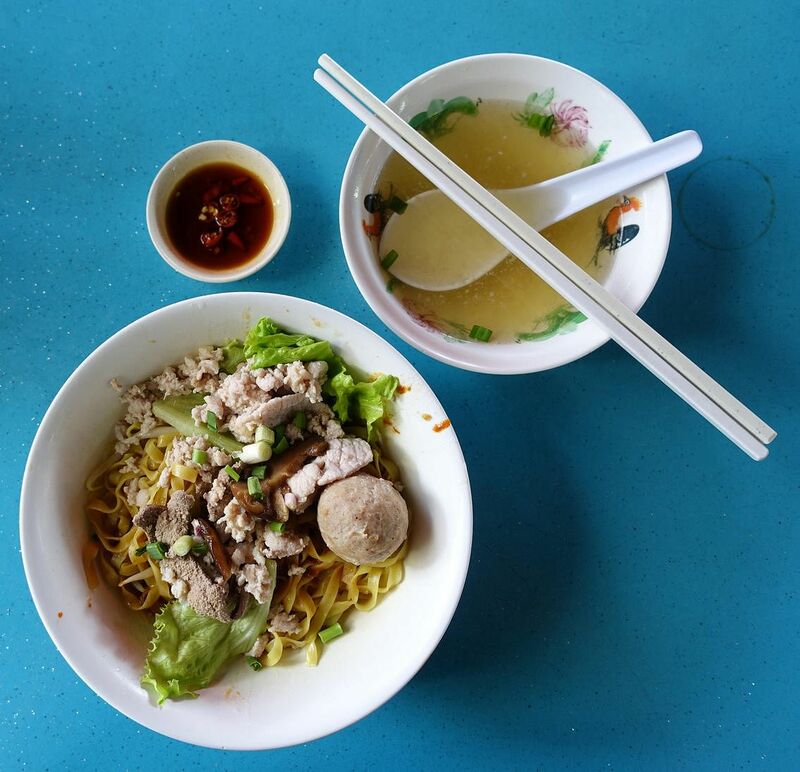 The second brother has a Thye Hong fishball noodle stall that is an institution in Ghim Moh Road, where the third brother also has a lor mee stall. 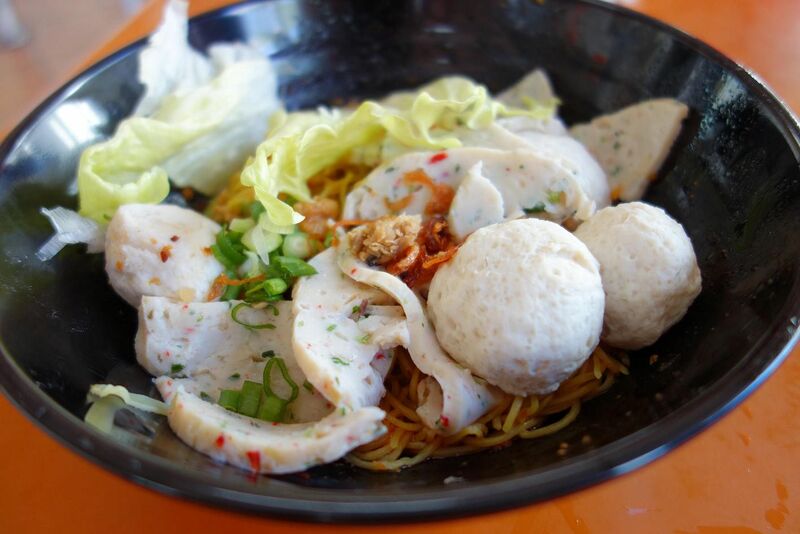 The fourth brother sells fishball noodles at Ru Ji Kitchen in Holland Drive. Thye Hong was started by his two eldest brothers, says Mr Ng. The name was taken from the Thye Hong biscuit factory in Alexandra Road, where the fishball noodle business began about 40 years ago as a street stand before moving to the Ghim Moh food centre in 1977. Mr Ng learnt the ropes in Ghim Moh before setting up a Thye Hong stall in Bukit Batok East Avenue 4 in 1989. He ran the stall till 2010, when a neck injury put him out of action. It was around then that his son, Ching Song, now 29, began to take an interest in the business. Under his father's tutelage, Ching Song, who is the youngest of three children, set up shop in Bukit Batok East Avenue 5 in 2012. Broadly speaking, the Thye Hong method includes making the fishballs by hand, preparing the chilli and mixing the noodles with lard and chilli thoroughly before serving them. The flavouring is heavier in Ghim Moh. The chilli is more fiery in Holland Drive. The version in Bukit Batok is milder - old-fashioned, even. Ching Song says he has learnt to make the dish (from $3) the old way by following his father's instructions. He does not take short cuts such as adding MSG to the soup. The stall has made a new concession, though. It uses less lard and the dish has a cleaner finish. Ching Song, who is married with a daughter, is straightforward when he is asked why he is following in his father's footsteps. "My father raised the three of us by selling fishball noodles and now I have a child to raise." Mr Wee Pong Sai, 66, has been running his hand-made fishball noodle stall in Ghim Moh market since 1977. His younger brothers run shops at Bukit Batok and Holland Drive. The Holland Drive outlet, called Ru Ji, is another one of my favourites. Here, its fragrant chilli and lard paste, as well as its fried fishcakes, are the highlight. 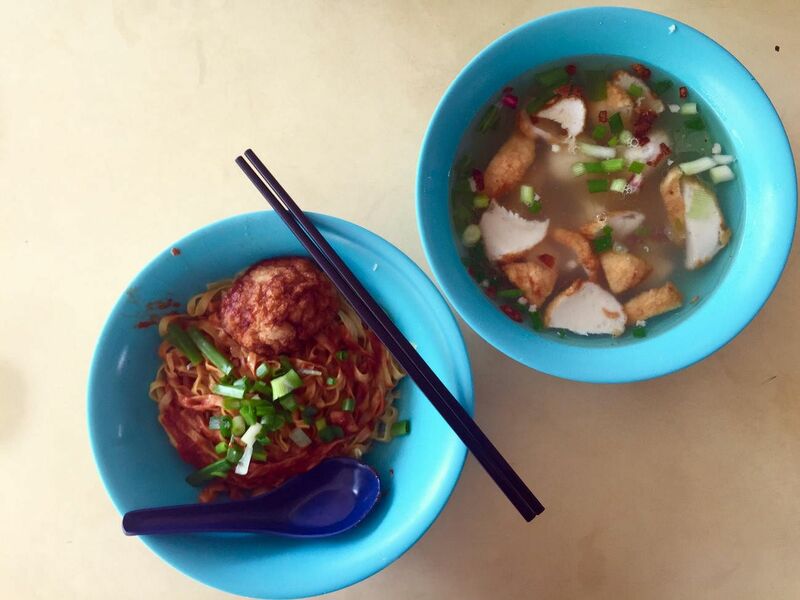 At Thye Hong in Ghim Moh, the fishballs are round but not perfectly so, while the fishcake is also unevenly shaped. The beauty of the fishballs and fishcake lies in their suppleness. Flavour wise, they are just salty enough and have a subtle sweetness. Mr Wee starts making the fishballs at about 5am. Fresh fish is minced and then mixed with some flour in a large electric mixer, before being hand-moulded into round balls. A bowl of noodles starts at $3. 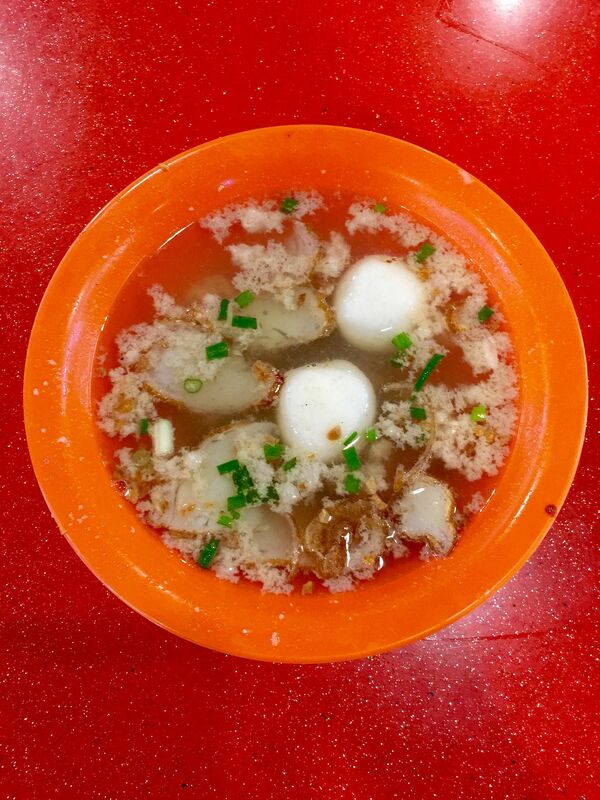 OPEN: 6.30am till the fishballs sell out which is usually before 10am, with ad hoc days off.